Why is there involuntary unemployment? The classical proof of the non-existence of "involuntary unemployment" consists of drawing intersecting supply and demand curves and showing that equilibrium is inevitable in the absence of a wage floor above the current equilibrium. We show here that all demand curves except the rectangular hyperbola implicitly assume constant aggregate demand. The classical proof against involuntary unemployment is thus a circular one, presupposing conditions that make involuntary unemployment impossible. The rectangular hyperbola is the only demand curve that makes no assumptions about aggregate demand. We show how an analysis using the rectangular hyperbola as the general demand curve results in involuntary unemployment. During the Great Depression in the US unemployment reached a peak of 25% in 1933 and nominal wages too fell heavily (by more than 30% in manufacturing and to smaller extents in other industries). The trouble was that classical economics did not allow for involuntary unemployment except in the special case of a wage floor. To J.M. Keynes it seemed that if facts contradicted theory it was time to change the theory. In The General Theory he wrote: "It is not very plausible to assert that unemployment in the United States in 1932 was due either to labour obstinately refusing to accept a reduction of money-wages or to its obstinately demanding a real wage beyond what the productivity of the economic machine was capable of furnishing. Wide variations are experienced in the volume of employment without any apparent change either in the minimum real demands of labour or in its productivity. Labour is not more truculent in the depression than in the boom—far from it. Nor is its physical productivity less. These facts from experience are a prima facie ground for questioning the adequacy of the classical analysis." Most other economists, though, felt that a theory that had served them so well in other circumstances could not be wrong and that there must be something in the facts that prevented the labour market from operating normally during the Great Depression. In general, their explanations have hinged around wage rigidity or wage stickiness. For instance, US president Herbert Hoover has been blamed for urging capitalists not to cut wages. Labour unions too have had to bear a share of the blame. That involuntary unemployment could be explained by anything other than rigid wages was an idea most economists could not accept. Already by 1946, in a classic misinterpretation, J.R. Hicks was saying that "Mr Keynes goes so far as to make the rigidity of wage-rates the corner-stone of his system". Paul Samuelson did not claim that rigidity was the corner-stone of Keynes's system but wished it had been so, writing in 1964: "Had Keynes begun his first few chapters with the simple statement that he found it realistic to assume that modern capitalist societies had money wage rates that were sticky and resistant to downwards movements, most of his insights would have remained just as valid." Since then the academic consensus has moved far more strongly against Keynes. For the New Classical school of Robert Lucas and E. Prescott involuntary unemployment does not exist at all. And the New Keynesians have adapted the New Classical methodology, adding wage and price stickiness to explain the high unemployment characteristic of recessions. So today, only a small number of economists, usually Post-Keynesians, still believe that there is something called involuntary unemployment and that it cannot be explained by wage stickiness. The demand curve is one of the building blocks of economics and a staple of ECON 101 courses. In textbooks the demand curve is sometimes depicted as a line, sometimes as a curve, sometimes both. The assumption is that the actual shape of the curve does not matter so long as the slope is negative throughout. 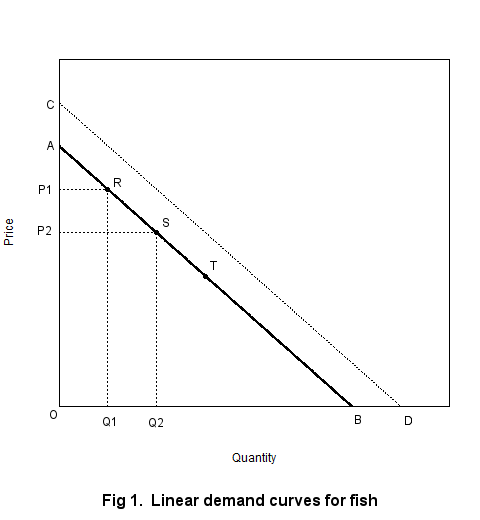 The figure below shows the market's demand curve for fish as a line. The original demand curve is AB. The demand curve is drawn assuming that people's incomes are constant as are their tastes. If people's incomes increase then at every price they can buy more fish and the demand curve moves to CD. 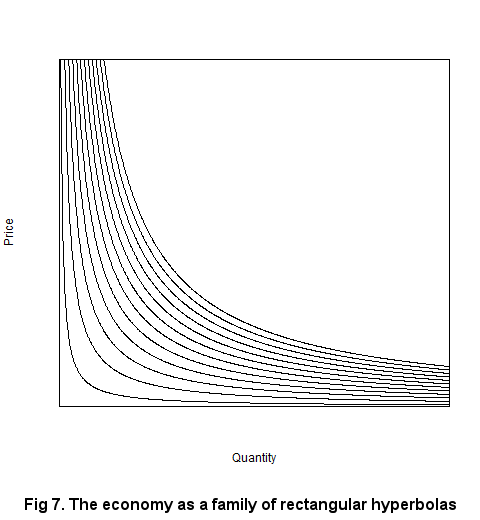 Similarly, if people develop an increased taste for fish the demand curve moves to CD. T is the midpoint of the demand curve. The segment AT is the elastic zone. The segment TB is the inelastic zone. 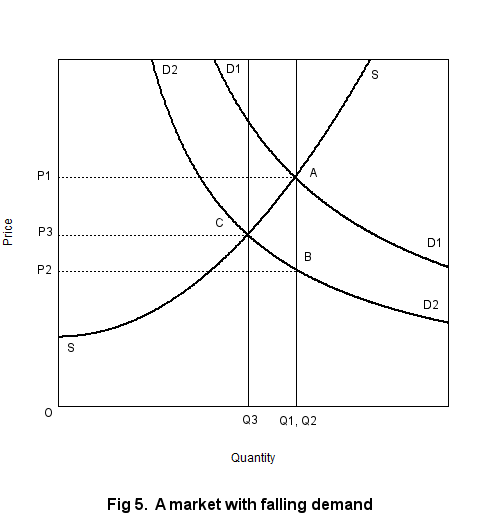 Assume that the initial equilibrium is at point R (in the elastic zone) where the price is P1 and the quantity sold is Q1. Assume also that at this point individuals spend all their income and do not save anything. 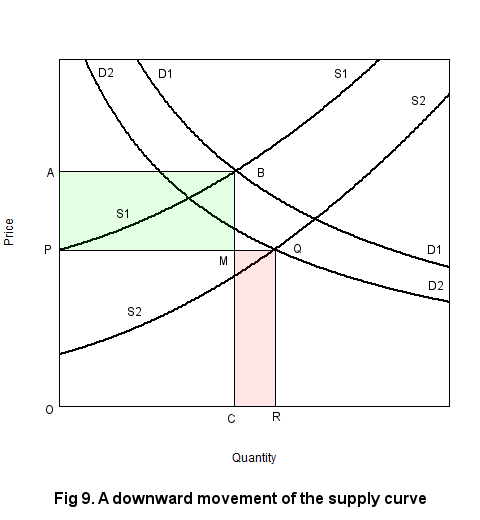 Next suppose that because of a movement of the supply curve the price falls to P2, also in the elastic zone, as a result of which the equilibrium moves to S. The quantity of fish bought increases to Q2. We can also see from the graph that the money spent on fish rises; the initial amount spent is the area of OP1RQ1 and the final amount spent is the area of OP2SQ2. But here we run into a problem. We had assumed that individuals spent all their income at the first equilibrium point R and now we find them spending a larger amount on fish at S. This can happen only if they spend a smaller amount on some other good or goods so as to maintain their spending constant. To summarise, along the elastic portion of a linear demand curve, when the price of fish falls not only does the quantity of fish bought increase but the money spent on fish also increases. So the money spent in other markets has to fall so as to maintain our initial assumption of a constant income. In general, the money spent at any point on the demand curve is different from that spent at any other point. To compensate for this difference the money spent in other markets, and therefore the demand, has to change. 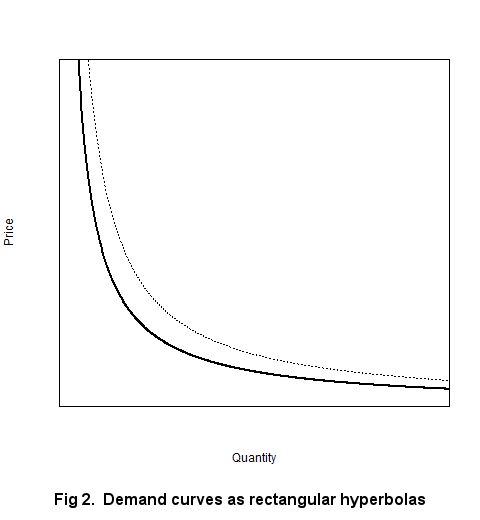 This feature of linear demand curves also applies to demand curves of other shapes, with a solitary exception: the rectangular hyperbola PQ = constant which is shown in the figure below. When the price of fish falls between two points on a rectangular hyperbola the quantity of fish bought increases. But the money spent on fish at the two points remains the same since PQ is a constant. Though the quantity of fish bought rises the increase does not come at the expense of spending on any other good. Using a minimal amount of reasoning we have thus arrived at some startling conclusions. 1. At first glance the linear demand curve for fish seems to be exclusively concerned with the fish market but in reality it is not so. It actually encompasses the economy as a whole and, in particular, it assumes that aggregate demand in the economy is constant. 2. This is true of all other curves as well, the exception being the rectangular hyperbola. The rectangular hyperbola is thus the general demand curve which makes no assumptions about aggregate demand. The linear demand curve and other demand curves are special cases relevant only to an economy in which aggregate demand is constant. 3. It is not surprising that classical economics has not been able to comprehend recessions or involuntary unemployment. When one of your basic building blocks is built specifically on the assumption that aggregate demand is constant no amount of manipulation will yield situations with involuntary unemployment which is a feature of economies with falling aggregate demand. 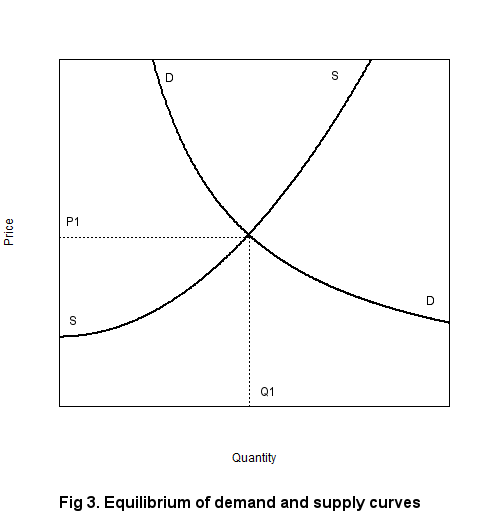 The standard demand and supply model is shown in the figure below. The demand curve DD and the supply curve SS intersect at the point (Q1, P1). This is an equilibrium point. At this point the quantity that suppliers wish to sell is equal to the quantity that buyers wish to buy. At any other price there will be either excess demand or excess supply. 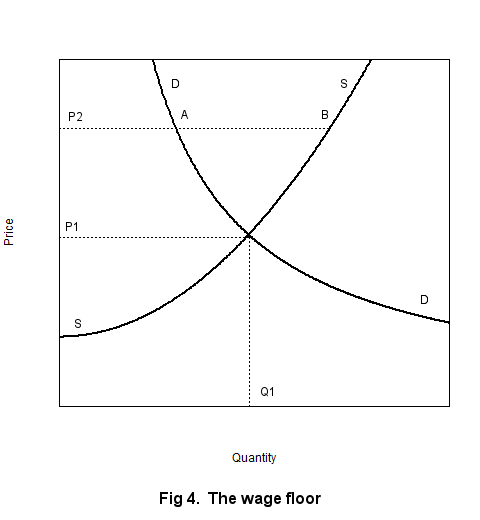 The next figure shows a wage floor. When a wage floor (e.g. a minimum wage, P2) is placed above the normal equilibrium point, the quantity of labour that workers are willing to sell exceeds the quantity of labour that firms are willing to buy. The resultant unemployment is measured by the length of the line segment AB. According to classical economics, the New Classical School and the New Keynesians this is the only cause for unemployment. We shall now show that there is another explanation by examining a Marshallian fish market as in the figure below. In this market fishing is carried on from Tuesday to Saturday. Sunday is a holiday. On Monday the fish are brought to market. The fish market is a highly perishable market (somewhat like the labour market). All fish have to be sold on market day and cannot be held until the next market day because there is not sufficient ice. For quite some time the demand for fish has been stable and is given by the curve D1D1. Similarly the supply of fish has been stable and is given by the curve SS. The equilibrium point is A when the price is P1 and the quantity of fish sold Q1. On one market day sellers discover that the demand curve has fallen to D2D2. Since fish cannot be held until the next market day sellers have to dispose of their entire stock Q2, which is equal to Q1, by selling at the price P2. But sellers cannot afford to sell indefinitely at that price especially if margins are narrow. The only way they could do so would be if the supply curve were to move downward and to the right to pass through point B. But that would mean additional capital investment. And what capitalist would be so foolish as to make additional investments when demand is falling? So the reasonable decision would be to cut output to Q3 and price to P3, which means remaining on the current supply curve. If the resulting margins are too small some firms will go bust and the supply curve will move up and to the left in which case the equilibrium price will rise and the equilibrium output will fall. In Fig 5, at points A and C, the quantity of fish that buyers are willing to buy is equal to the quantity that sellers are willing to sell. If sellers of fish sell a smaller quantity Q3 it is because at that price they are not willing to sell more. And if the market for labour is anything like the market for fish, we must conclude that more workers are not hired because workers are unwilling to sell their labour for a lower price. And if that is the case then, as someone joked, there is really no reason that the Great Depression should not be called the Great Vacation. If unemployment during a recession is involuntary there must be something that makes the labour market different from the fish market or the corn market. And it is to this that we now turn our attention. We begin by examining some features of Fig 5. The initial demand in dollars is given by the area of the rectangle OP1AQ1 and the final demand by the area of rectangle OP3CQ3. The change in demand is given by the area of P1AQ1Q3CP3. Another point to note is that though quantities in different markets are measured by a variety of units e.g. bushels of wheat, tonnes of fish, boxes of pencils, millions of workers and so on, the areas of the rectangles OP1AQ1 and OP3CQ3 are always measured in dollars. Assume that the equilibrium demand in the fish market when the price is $1 per kilo is 2 million kg. The demand measured in dollars is therefore $2 million. Suppose we choose to measure the weight of fish not in kilos but in oliks (an olik is a kilo reversed) where 1 kilo is equal to 0.25 oliks. In oliks the demand is 0.5 million oliks. Since the revenue in dollars continues to be the same the new price is $4 per olik. The product of the price and the quantity must always be $2 million, no matter what the units we decide to measure the quantity in. 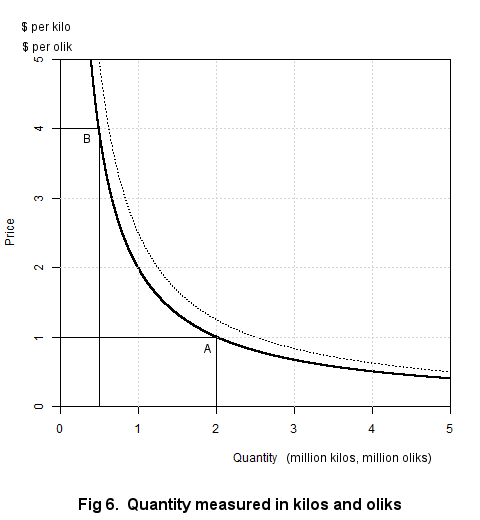 Fig 6 below depicts the demand in kilos and oliks, both measured to the same scale on the same graph. A is the equilibrium point when quantity is measured in million kg and the price in $/kilo. B is the equilibrium point when quantity is measured in million oliks and the price in $/oliks. The curve in the figure is of course the part of a rectangular hyperbola lying in the first quadrant, because only on such a curve would the product of P and Q be a constant. If the demand for fish shifts up a little, the new demand in dollars would lie on another rectangular hyperbola a little above the old hyperbola, shown by the dotted line in the figure. But the new equilibrium points cannot lie anywhere at all. The new equilibrium in kilos would have to lie to the right and above the old equilibrium in kilos. And the new equilibrium in oliks would have to lie to the right and above the old equilibrium in oliks. This is because, assuming that the supply curve has not shifted, suppliers would be ready to supply a greater quantity only if they got a higher price. The exact point is determined by the intersection of the demand curves with the respective supply curves with quantities measured in kilos and oliks and prices in $/kilo and $/olik. To summarise the argument so far: No matter what the measure of quantity and the measure of price in the fish market, the equilibrium points will always lie on the same rectangular hyperbola because the demand (measured in dollars) is the same. We can extend the argument and state that if the demand for chewing gum measured in '000 sticks and the demand for pencils measured in '000 boxes are both $20 million, then the equilibrium points of both will lie on the same rectangular hyperbola. Both price and quantity in the rectangular hyperbola vary from zero to infinity. In practice the price of a good varies between narrow limits so the demand curves for chewing gum and pencil will consist of short stretches of the same rectangular hyperbola which need not share any parts in common. Extending the argument still further we can say that every market in the economy can be represented on a single graph by any one curve of a family of rectangular hyperbolas as in the figure below. Small markets like the pencil market lie close to the origin. Large markets like the market for cloth are situated far from the origin. Taking the fish market as an example the family of curves above may be interpreted by considering four illustrative cases (there can be many more). a) The aggregate demand in the economy (measured in dollars) and the demand for fish (also measured in dollars) are constant. In this case the demand for fish lies on a single rectangular hyperbola. When the price of fish rises the quantity demanded falls, and when the price of fish falls the quantity demanded rises. b) The aggregate demand in the economy is constant but the demand for fish is not. Assume, for instance, that the demand for fish falls because consumers' tastes shift towards chicken. In this case the demand for fish falls to a lower rectangular hyperbola and the demand for chicken shifts towards a higher rectangular hyperbola. The shifts cancel exactly. c) The aggregate demand in the economy falls and the demand for fish falls. In this case the demand for fish falls to a lower rectangular hyperbola but is not compensated by a rise in the demand for chicken. In fact, the demand for chicken also falls to a lower rectangular hyperbola. d) The aggregate demand in the economy and the demand for fish both rise. In this case the demand for fish and the demand for other goods all rise to higher rectangular hyperbolas. We are getting closer to the end of our explanation. The demand for wheat depends on the demand for flour and the demand for flour depends on the demand for bread. The demand for iron ore and coal depend on the demand for steel. But the demand for wheat does not depend on the demand for steel and the demand for iron ore does not depend on the demand for bread. Labour, however, is an input for the wheat, flour, bread, iron ore, coal and steel industries and indeed every industry. So labour is the largest market in the economy. Similarly, a fall in the demand for wheat, flour, bread, iron ore, coal, steel and any other industry causes a fall in the demand for labour. So not only is labour the largest market, it is also subject to the largest fall in demand by magnitude. So whereas demand for most industries will fall a short distance through a small number of rectangular hyperbolas, the demand for labour will fall by a large magnitude, which means it will fall through a large number of rectangular hyperbolas. The figure below depicts the fall in demand. At the intersection of the supply curve with the lowest demand curve, it will be seen that the demand curve is nearly vertical. And the characteristic of a vertical demand curve is that even if the supply curve is moved down (which means even if workers are willing to work for lower wages) the quantity of labour demanded will not increase. When there are workers willing to work for lower wages, firms can sack their existing workers and hire new workers at lower wages but the total demand for labour (measured in number of workers) will not change. But this of course is the definition of involuntary unemployment. It is because labour is the largest market in the economy that it is the first to experience a vertical demand curve in a recession and the last to recover from it. In a full-blown depression many other large markets too may experience the same condition. Aggregate demand being even larger than the labour market will experience an even greater contraction and may thus be expected to become vertical during recessions. The rectangular hyperbola has the interesting feature that it has microfoundations mathematically built into it. This is because unlike, say, linear demand curves, rectangular hyperbolas add up to give rectangular hyperbolas. Consider three rectangular hyperbolas PQ = a, PQ = b, and PQ = a + b. When P=P1, the value of Q for the first rectangular hyperbola is a/P1. When P = P1, the value of Q for the second rectangular hyperbola is b/P1. Adding the values of Q gives (a+b)/P1 which is the value of the third rectangular hyperbola at P=P1. What this means that if the demand curves for individuals (whom we may consider as the representative agents) for a particular commodity are rectangular hyperbolas, then the market demand curve for that commodity is also a rectangular hyperbola. Similarly, adding up the rectangular hyperbola demand curves for all markets gives us the aggregate demand curve which also must be a rectangular hyperbola. There is symmetry in this. It is only when the demand curve is viewed in interaction with the supply curve that asymmetries crop up for large movements of the demand curve. This is because the supply curve begins to intersect the demand curve at positions where the demand curve is more and more vertical. For ordinary recessions this happens only with large markets such as the labour market and aggregate demand. So far we have dealt exclusively with movements of the demand curve. 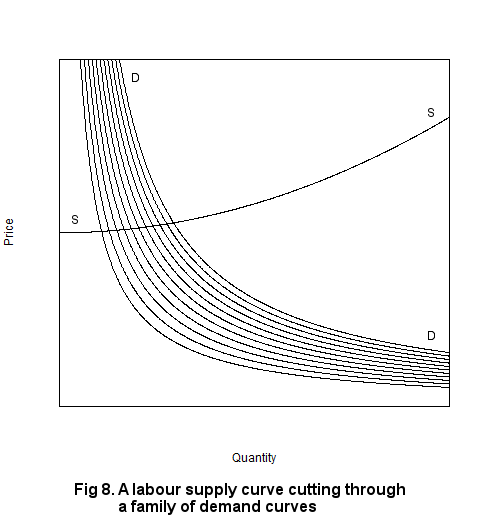 We now take a look at movements of the supply curve as in the figure below. The initial demand curve is D1D1 which shifts downward to D2D2. The initial supply curve is S1S1 which shifts to S2S2. The initial effective demand in dollars (or revenue) is given by the area of the rectangle OABC. The final effective demand in dollars (or revenue) is given by the area of the rectangle OPQR. The area of rectangle ABMP represents the revenue lost as a result of lowering the price. The area of rectangle CMQR represents the revenue gained as a result of selling a larger quantity. When the area of rectangle CMQR is greater than the area of the rectangle ABMP there is a net gain of revenue by moving the supply curve downwards. When the demand curves are nearly vertical it can be seen that the area of rectangle ABMP is very large and the area of CMQR is very small. In the limiting case when the curve is vertical the area of CMQR becomes zero. So there is nothing to be gained by moving the supply curve downwards. So Keynes was right in asserting that a reduction in wages would be detrimental during a recession. The first reason, as can be seen from Fig 9, is that it would not result in an increase in the quantitative demand for labour. And, more important, because the resultant fall in aggregate wages would result in a further fall in aggregate demand. Finally, a little historical aside would be appropriate. In the General Theory Keynes wrote: "Obviously, however, if the classical theory is only applicable to the case of full employment, it is fallacious to apply it to the problems of involuntary unemployment—if there be such a thing (and who will deny it?). The classical theorists resemble Euclidean geometers in a non-Euclidean world who, discovering that in experience straight lines apparently parallel often meet, rebuke the lines for not keeping straight—as the only remedy for the unfortunate collisions which are occurring. Yet, in truth, there is no remedy except to throw over the axiom of parallels and to work out a non-Euclidean geometry. Something similar is required to-day in economics." Keynes meant the reference to geometry only as an analogy. But in one way it is also literally true. Rectangular hyperbolas are not non-Euclidean in the sense of being parallel lines which meet; they are non-Euclidean in a different sense, being non-parallel lines which never meet. With parallel demand curves involuntary unemployment is a theoretical impossibility. With non-parallel rectangular hyperbolas involuntary unemployment is a theoretical inevitability.